Last Saturday, we made a quick trip over the mountains into West Virginia. The foliage in the Canaan Valley (Tucker County) area is always way ahead of the color change in Virginia. We set out from home at 5:00 a.m. and made stops at Blackwater Falls State Park, Canaan Valley State Park, Douglas Falls and Dolly Sods Wilderness. Our whirlwind trip got us thinking about how many short walks in that area have major scenic payoffs. 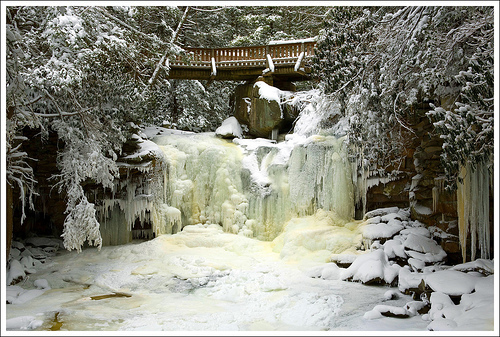 Let’s start off with a few beautiful spots in Blackwater Falls State Park. All of the spots listed below are clearly marked on the park’s trail map. Pick up a copy at the lodge. The view from Lindy Point looks down into the Blackwater Canyon. The walk out to Lindy Point is no more than a third of a mile along a relatively level path. The trail passes through dense rhododendron and can be quite muddy if there has been rain. At the end of the trail, you’ll come out to a platform built onto the side of the rocky cliff. 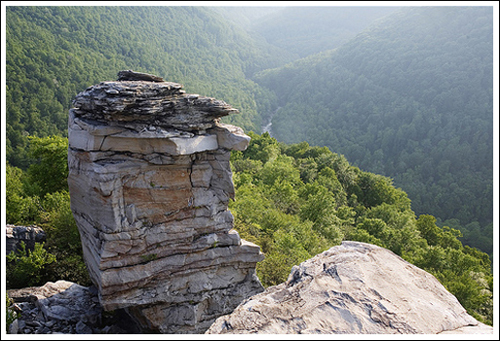 The point offers a spectacular view of the Blackwater Canyon. If you sit quietly, chances are good that you’ll hear the river rushing through the chasm below. The view is made even more unique due to the enormous free-standing rock “chimneys” that surround the platform. There are several places that you can crawl through the rhododendron to stand directly on the rocks for a better view. Despite the spot’s beauty, Christine has not had great luck photographing this spot, but it’s all been a matter of timing. We’ve just never been lucky enough to hit the point on a day with nice “photo skies.” The photo included really doesn’t do the place justice. There are several “falls of Elakala” along Shays Run. This pretty waterfall is accessed by a short trail starting out from the park’s main lodge. The falls are less than a quarter mile down the trail. You’ll know you have reached the waterfall when you come to a wooden footbridge over Shays Run. The falls cascade directly under your feet at this point. The trail really doesn’t give you a good look at the waterfall, so take the time to follow the “unofficial” foot path down the ravine to the base of the falls. Elakala is prettiest in times of heavy waterflow. The stream leaving the base of the falls takes a beautiful swirling path across the moss-greened rocks. Don’t miss climbing a little farther down the ravine to see a couple other pretty waterfalls on Shays Run. The stream actually cascades all the way down to the bottom of the Blackwater Canyon, but it’s not really safe to go much beyond the second or third cascade. Last winter we were lucky enough to see Elakala falls completely frozen over. The sound of the water running under the ice was magical that day. This 62 foot cascade is park’s namesake and #1 attraction. You’ll have a couple options for accessing the waterfall. The park road that heads toward the main lodge has a paved, wheelchair-accessible path to a viewing platform far above the waterfall. The road that heads toward the picnic ground has a longer “staircase-path” that leads to several wooden viewing platforms. This path puts you a lot closer to the waterfall and offers a much prettier view. We’ve always liked visiting Blackwater Falls as soon as the sun comes up. At dawn, the path is deserted and the falls are often shrouded in a thin veil of fog. During more normal times, the area is extremely crowded with tourists. And now a couple favorites outside the park. The colors of Douglas Falls are amazing! Blackwater Falls might be the area’s best-known waterfall, but we think Douglas Falls is the most beautiful. The rocks are brilliant red and the water is vivid green, making for a wonderfully photogenic color contrast. The color of the rocks is sadly unnatural, created by acid drainage from the mines and coke ovens in the area. It’s amazing that pollution could create something so pretty. The ride out to the falls is extremely rugged and potholed. You should plan on walking a mile or two if you don’t have a 4WD vehicle. The footpath down to the falls is very short, but very steep. Once you get down to the base of the falls, there is a path that follows the stream for a couple hundred yards. The whole area is worth exploring, but take extreme caution on the slippery rocks. The rocks around the stream are coated with slick, clear algae. We always move “crab-style” along the rocks to keep from falling. The landscape of Dolly Sods reminds us of Maine. 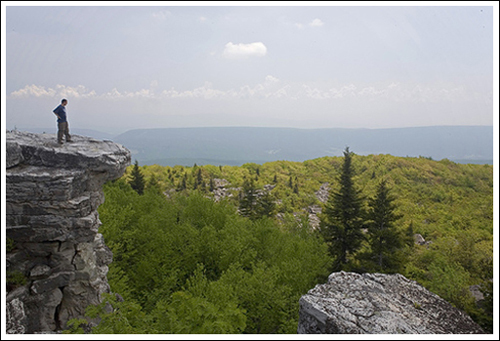 Another place to visit in the area is Bear Rocks in the Dolly Sods Wilderness Area. The overlook is surrounded by a vast plain of huckleberry and blueberry bushes that turn blaze red in the autumn. It’s a great place to spot migrating hawks. The rocky cliff is endlessly fun to scramble around on and provides beautiful views of the valley below. The plains framing the cliff are patterned with pathways through the berry bushes and punctuated with monolithic white rocks that have been sculpted by time and the elements. Whenever we visit Dolly Sods, we feel like we’re someplace far north of the Mid-Atlantic region. It feels more like Maine or Canada. There are several routes into Dolly Sods. We recommend the route from WV32 onto Laneville Road as the most passable and scenic. You might even see a black bear along the road if you’re lucky. Hi ! This is such a random question, but you wouldn’t happen to have an actual itinerary that you used, would you? With like, how long you spent at each place, how long the whole excursion was, etc etc? Do you want to visit ALL these places? How long do you have? I will be there for a full weekend! May 27th-May 30th! I think I would set aside a day for the first four (Lindy Point, Elakala, Blackwater Falls, and Douglas Falls). They’re all close together and don’t take long to walk to and enjoy. I would dedicate the other day to exploring Dolly Sods. It’s a longer, more arduous drive and there is a lot to see along the way to Bear Rocks. Pack lunch on your Dolly Sods day! Thanks for the write up. I used this as well as whatever else I could find on the web to make the 300 mi+ trip to Blackwater Falls yesterday, along with Elakala and followed up with Cucumber Falls. I had hoped to see Elakala 2&3, but no luck. I could see the path to #1 from the bridge; otherwise I would have never found it (I was successful getting down to #1). There were all sorts of downed trees beyond this path, so maybe that’s why I was unsuccessful. Do you have any tips or resources for getting down to 2/3? Thanks! Hmmm… I’ll check out the route on my next trip down. I don’t remember it being complicated. VERY appreciative of this! Just finished planning an all day trip to go check out a few of these spots. Enjoy! Thanks for the visit! Thanks for the visit, Jim! We spent the weekend down in the Mt. Rogers Recreational Area.